Thanks to Carmen of the LayMAN for her latest editorial, nFOG: Trying to renovate a house that's eaten up with termites (charming title, eh?). In case you were wondering, the "house that's eaten up with termites" is the PCUSA and nFOG is the proposed new form of government. Guess who the termites are? ...we have entire judicatories thumbing their noses at the definition of marriage and the qualifications for church leadership. We have preachers foregoing the Scriptures opting instead for the Koran and we have mission dollars being spent on national political agendas that are not widely agreed upon by the people populating Presbyterian pews. Who are these preachers who have opted for the Koran? If I wasn't so humble I would guess she is talking about me. We are reading the Qur'an cover to cover in 2009 and our next Qur'an Sunday is the 27th. You might be interested in Qur'an and Jive, the blog I have created for this occasion. Of course she may be referring to another Presbyterian Termite who is also studying the Qur'an. If so, let me know as I want to compare notes. I could use some help eating this house. It is a big house after all. I'M A TERMITE! And proud of it! [B]y the very nature of their wood-eating activity, termites produce nitrogen and distribute it to the ecosystem. Their value is especially evident in forest ecosystems. Scientists explain this by saying that termites are somehow related to bio-geo chemical cycling of nutrients. Bio-geo chemical cycles include carbon, oxygen, nitrogen, sulfurus and other compounds. When termites forage for food, they also build tunnels that can be conduits for bacterial and fungal activity. Fungi are also known to have the capability of releasing nitrogen, iron, calcium, zinc and other elements. [A]s a corollary to benefit, scientists Wood and Sands (1978) say that termites have the ability to influence their structural and chemical environment, and this influences vegetation in a significant manner because of their nitrogen-giving nature. Entomologists ... point out that termite activity is critical for regulating soil processes such as water and nutrient distribution and maintenance. 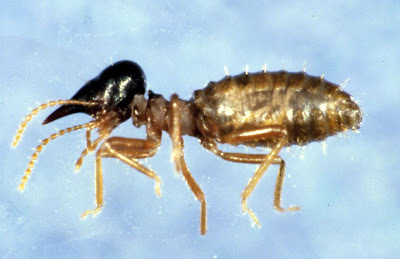 By performing this role, termites contribute to biodiversity. They make it possible for creatures like reptiles and frogs to have a steady food supply. If y'all are termites, we're the frogs and reptiles. I'll take it! Personally I love hearing again and again the complaining from the far right that the nFOG doesn't say that Jesus is the only way to salvation. Anyway, why do I love that whining? (Well, I find all fringe right whining amusing on its face, obviously.) But I particularly enjoy this whining because it shows that these good folks have never bothered to actually read the *current* FOG, and therefore they've never realized that they belong to a denomination that does not *currently* state in its FOG that Jesus is the only way to salvation. Even more amusing is that, after people have pointed this out countless times, they still don't get it. They're apostate just like the rest of us, it seems. How dare they belong to a denomination that doesn't state in its FOG that Jesus is the only way to salvation? They've gone from being holier than thou to holier than ... um ... they(? ), which is a new level of absurdity even for the Layman. BTW, I'll just point out that termites have been around for at least 65 million years, a lot longer than the Presbyterian Lay Committee and will still be around long after they're gone, so perhaps the analogy, as strained as it is, is not so bad after all. And since no blog comment is complete without a quote from the Simpsons, "I for one welcome our new insect overlords." Sign me up. I'm a termite. Lord, I want to be a termite in a my heart. Welcome insect army. Let us infest! 2) Make a nonsensical connection to other random "heresies" (gays, Muslims, and General Assembly resolutions work well). 3) Find a repulsive metaphor to describe the imaginary enemy (ie. termites). How offensive to be referred to as a termite. It doesn't do much to facilitate dialogue, does it? I can see this in the context of some secular fight, but in the House of God? I was just reading the good book today. We would all do well to remember the admonition in John 4:21, "Whoever loves God must also love his brother." And of course, there's Matthew 5:21-24: "But anyone who says, 'You fool!' will be in danger of the fire of hell. Therefore, if you are offering your gift at the altar and there remember that your brother has something against you, leave your gift there in front of the altar. First go and be reconciled to your brother; then come and offer your gift." Of course, it works both ways. In Matt, if you know that HE has something against YOU, then you are required to reconcile. ... hard stuff there.